This is a draft version of my first LRGB and first color image from a dark sky site. I am still struggling with the image processing of this image in several areas including the color saturation loss from the LRGB process, getting the correct sharpness in the nebula, and keeping the starfield from bloating without losing star sharpness. Comments and suggestions are encouraged. "Click on the Image to Enlarge to Full Size"
The Veil Nebula in the constellation of Cygnus, the Swan is one of the most beautiful and interesting objects in the sky. Deep sky photography using long exposures on film or moderately long exposures with CCD cameras reveal awe inspiring details of the remnants of this ancient supernova explosion. 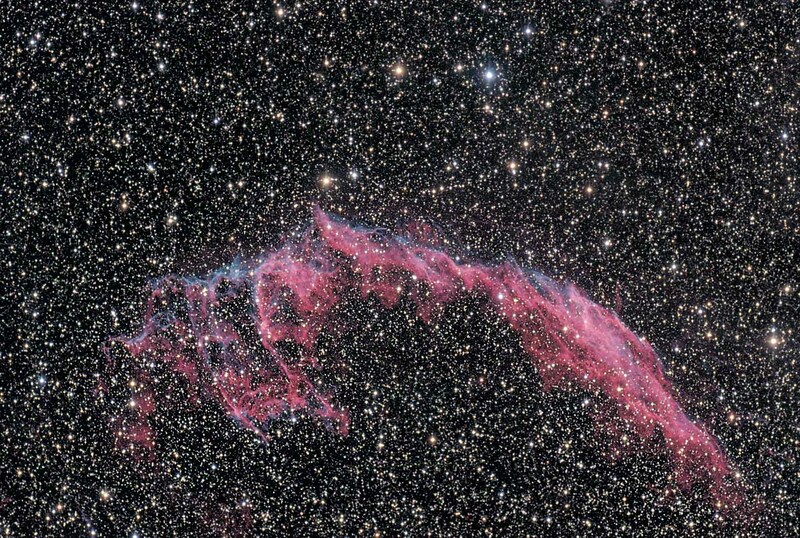 Catalog number NGC 6992, a portion of the Veil Nebula is actually expanding debris from the supernova explosion of a star that took place over 5000 years ago. The Veil Nebula is approximately 1,440 light-years away (reported distance has been changing and continues to change based on recent scientific studies). The picture shows the fine colored wisps of gas which are filaments of shocked interstellar gas along the shockwave of the expanding supernova remnants. As the expanding supernova material smashes into the gas, the gas glows and forms the visible wisps of this image. The expanding material hits the gas at a speed of more than 600,000 kilometers per hour. All images, text, and data on this site are copyrighted. They may not be used except by written permission from Rick Wiggins. All rights reserved.